European windstorm exposures as measured by insured property values included in the PERILS AG Industry Exposure Database have risen by 4.5% to a huge €54 trillion in the latest release of the industry sums insured data set. Zurich-based PERILS AG, a provider of industry-wide European catastrophe exposure, industry loss data and indices, has released its 2016 update to the exposure database, containing exposures as at an in-force date of 1st January 2016. Exposure data is vital for insurance and reinsurance companies to make informed decisions, when it comes to underwriting, risk transfer and business development or expansion. They are also widely used for risk model validation and calibration, as well as for modelling and informing ILS transactions such as catastrophe bonds. The IED database holds over 40,000 individual records of natural catastrophe exposed sums insured by CRESTA zone, property line of business (residential, commercial, industrial or agricultural) and coverage type (building, content or business interruption). Data on the prevailing contract deductibles and insured limits has also been updated with this release. 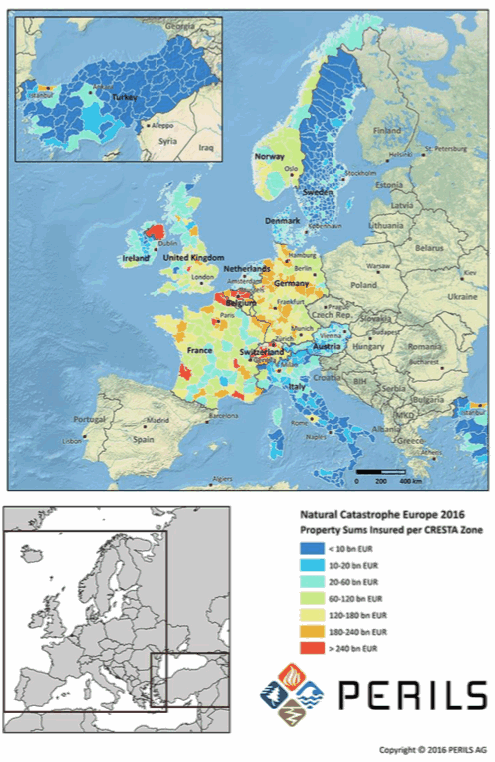 The biggest exposure in PERILS IED is European Windstorm risk, as you’d expect, and for this release the overall windstorm property sums insured increased by 4.5% (+2.8% at constant FX rates) compared to 1st January 2015, representing a stunning EUR 54 trillion of insured property values. 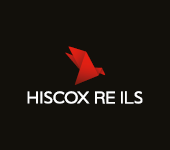 EUR 54 trillion of insured exposure is a huge sum and given the European property catastrophe reinsurance market is so much smaller, demonstrates the size of the opportunity that accessing this risk more directly presents for ILS markets. It’s clear with such enormous sums at risk that capital efficiency to transfer the risk is key and no surprise that ILS fund managers and markets are beginning to find ways to access insurance business more directly with their capital. PERILS said that changes in sums insured on a country by country basis show greater variation and that the year-on-year developments are mainly driven by movements in collected sums insured data and movements in insurance market benchmarks. This is also the first time that the PERILS IED has contained Turkish perils, with the addition of both Turkey flood and earthquake sums insured information, following PERILS entry into that market in November 2015. The PERILS database also contains similarly granular event loss data for the same countries and perils, as well as physical intensity measures, such as gust speed information, for each captured event loss. The map shows property sums insured exposed to the peril of windstorm and earthquake (Italy, Turkey) as per 1 January 2016. Compared to 2015, the total sums insured over all windstorm markets increased by 4.5% (+2.8% at constant FX rates). The sums insured data are available in a CRESTA zone, property line of business and coverage type resolution to subscribers to the PERILS Database.